The growing resource scarcity we face in the world today calls ever-louder for sustainable answers. So the need for durable and healthy product design is thus becoming increasingly important, especially in the building sector. When it comes to circular product design, Cradle to Cradle Certified™ is the reference in today’s building industry. Not only because of its wide scope, but also its very stringent demands (no product has made it to the Platinum level yet) trigger a crucial push in the quality and innovation of circular products. At Thermaflex, future-proof is a guiding principle in the development of our solutions. That's why we are thrilled to announce today's awarding of Cradle to Cradle Certified™ Bronze for ThermaSmart PRO, a global first for technical insulation! Our commitment to healthy environments and making scarce resources meet future demands has led us to achieve a 90% Cradle to Cradle Certified™ assortment. First in line was our flexible, pre-insulated Flexalen 600 pipes for thermal energy transport, now upgraded from with Cradle to Cradle Certified™ Basic to Silver. 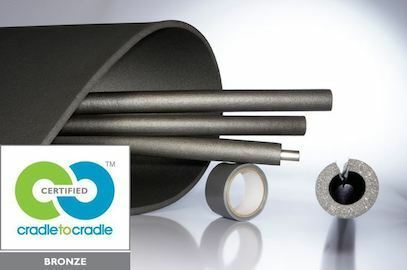 Now, we also managed to secure Cradle to Cradle Certified Bronze for Thermasmart PRO, our technical tube and sheet insulation for existing installations – the world’s only of its kind. Check out the product certificate and material health certificate in our knowledge center! Building developers, owners and end-users become increasingly aware of the value and importance of products with a sustainable design. For a developer, durable and energy-efficient piping systems and insulation are usually foremost assets to secure when aiming for LEED or BREEAM-certified buildings. For an owner, the value of the property is simply much higher when high-quality materials with a long lifetime are used, while ensuring a maintenance-free living environment for residents. But most important are the end-users, who get to enjoy a healthy and comfortable indoor climate at minimal financial and environmental cost.